Mrs Peanuckle is a creator of themed alphabet concept books. She has written alphabet books about birds, flowers, fruit, trees and vegetables. 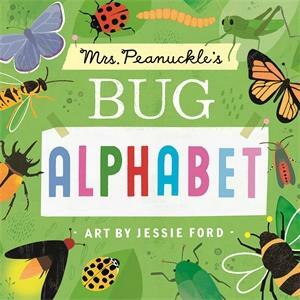 Her new board book, Mrs Peanuckle's Bug Alphabet, is not an ordinary ABC's concept book of words, it is a fact book about 26 insects. Mrs Peanuckle's facts combined with Jessie Ford's colourful illustrations bring the insects to life, such as the pretty butterflies and moths, the strong ants and the germy housefly. Mrs Peanuckle's Bug Alphabet book not only encourages children to think about insects but also how nature needs protecting so we don't end up with extincted insects and animals, like the butterfly Xerces. Please not that this book contains US English spelling and northern hemisphere seasons.